This South Philly BYOB is Always Busy – but Does the Food Measure Up? Mixing Italian-American classics with some original creations, Scannicchio’s doesn’t always meet expectations. South Philadelphia has long been associated with classic, “red gravy” Italian food and restaurants, one of which is the highly popular Scannicchio’s. Open since 2003, this BYOB establishment on Broad Street serves both the expected “South Philly”-style food, but also some more unique dishes which make it stand out from the crowd. While not every dish succeeds equally, Scannicchio’s certainly is worth visiting for a taste of the Italian cuisine which has made this neighborhood famous. While the Scannicchio’s location in Philadelphia, Pennsylvania is relatively new in South Philly terms, the Varalli family has operated a sister restaurant in Atlantic City for over 30 years. 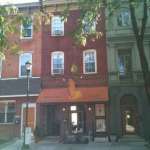 For their Philadelphia location, owner/chef Christian Varalli and partner Mike Gibson have focused on “homey Italian cuisine” that it meant to appeal to neighborhood residents, tourists, and also those attending events at the nearby sports complex, which is in walking distance or a single subway stop away. Reservations are strongly recommended even on weeknights, as the restaurant fills up quickly after opening every night for dinner at 5:00pm. 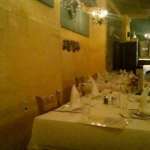 Entering Scannicchio’s, one finds a small dining room which is comfortable, if on the small and unexciting side. The bar-style area in the front suggests this corner location at one time had a liquor license, but today it is strictly bring-your-own. Service is prompt, if not overly friendly, as our waiter quickly introduced himself to bring menus, open our bottle of wine, and recite the evening’s specials. We were also provided with a warm basket of fresh Italian bread, which was very tasty with their homemade roasted red peppers also provided free of charge. Scannicchio’s menu is a mix of traditional Italian-American favorites and some unique house specialties. Appetizers/antipasti range from the classic Mozzarella Sticks ($5.95) and Fried Calamari ($7.95) to Escargot ($7.95) and Clams Casino ($15/dozen). 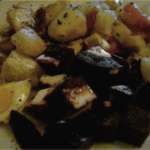 Numerous soups and salads are offered, such as a standard “Pasta e fagioli” ($4.00) and an Insalata di Scungili ($10.95). Pastas are expected offerings such as Fettucini Alfredo ($12.95), Manicotti Al Forno ($13.95), or a choice of pasta with either Meatballs, Sausage, Red or White Clams or Crab Meat ($10.95 – $18.95). Fish dishes include a traditional Italian-American Stuffed Calamari ($17.95) and a 7-fish dinner of lobster, clams, mussels, shrimp, scallops, calamari and clams over linguine ($27.95 for Red, White or Fradiavolo sauce). 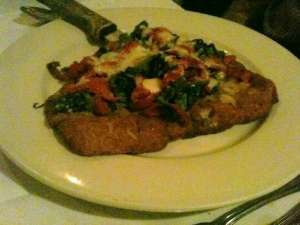 Veal is heavily featured in seven different preparations such as Vitello Alla Milanese or Vitello Piccata ($16.95 – $18.95). Chicken and beef dishes feature many classic preparations as well, such as Chicken Cacciatore ($15.95), Braciola ($13.95) and even traditional Tripe simmered in plum tomato sauce ($12.95). 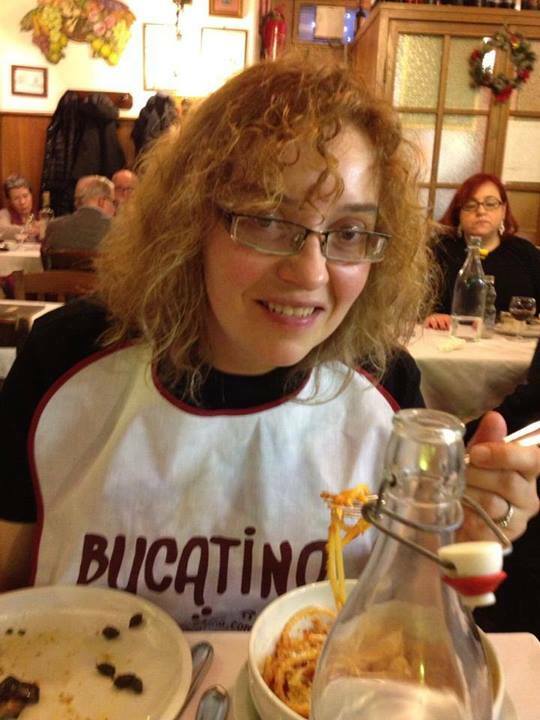 My companion and I were both quite hungry when we arrived, so we decided to sample three antipasti as well as order two main courses. We selected to start with the Stuffed Whole Artichoke, plus two specials of the evening: Fried Meatballs with Broccoli Rabe and the Grilled Romaine Salad with Strawberries and Cherry Tomatoes. The meatballs were easily the most impressive dish: savory, perfectly cooked, and needing little adornment except for the well-cooked broccoli rabe and some shaved cheese. 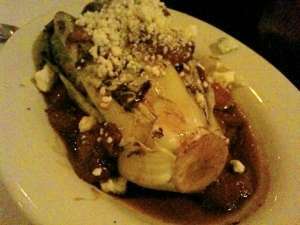 The grilled romaine salad, to my taste, was over-dressed and heavy handed, with too much cheese and oil, and the tomatoes and strawberries did not blend very well. According to other reviews, this is an extremely popular regular special but I’m not sure why, unless many just enjoy the overly-sweet flavor. The stuffed artichoke was tasty but a bit heavy-handed as well, with a thick garlic-butter sauce covering most of the artichoke and its bread stuffing. Better were the main courses we chose. One, a special of the night, featured a Brazilian white fish with a tomato, lemon and olive sauce. I adore the salty-sour combination of olives, lemons and capers and this dish dish a wonderful job of showcasing these classic Italian flavors. Our other main course was the Vitello Alla Milanese Italiano, which featured a thin-cut breaded veal cutlet topped with broccoli rabe, roasted peppers, and provolone cheese. This dish also featured a heavy-hand with the garlic, which I had to be careful of as I have a minor intolerance, but the cutlet was well-prepared and the flavors of the dish quite nice. The veal was served with a side of penne in a fairly standard marinara sauce. Surprisingly, we still had some room to share a dessert as all portions were well-sized but not overdone. 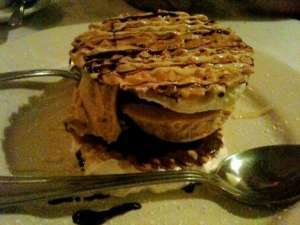 Dessert was perhaps the standout of the meal, an “Ice Cream Sandwich” featuring hazelnut gelato sandwiched between two homemade pizzelles. It was completely satisfying without being too heavy nor too sweet, perfectly enjoyed along with an espresso and a complementary glass of house-made pineapple liquer. Our meal of three appetizers, two entrees, dessert and coffee was a reasonable $80 before tip. Overall I found the experience of dining at Scannicchio’s to be pleasant, but not quite up to the more contemporary and fresh approach to Italian cuisine to be found in Philadelphia’s Center City BYOBs. The style of cooking was a bit too Americanized, very heavy on the garlic and fried foods where a lighter hand could be beneficial. 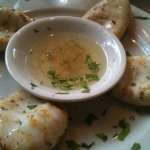 Still, for that “South Philly” experience, Scannicchio’s delivers satisfactorily . Scannicchio’s is open 7 days a week for dinner and also serves lunch, and is available for private parties and other special events. It is located on Broad Street within a few blocks of the Oregon Avenue Broad Street station. This review was originally posted at Yahoo! Voices on November 17, 2010. This entry was posted in Philadelphia restaurants and tagged byob, italian restaurants, philadelphia, restaurant review, Scannicchio's, south philly. Bookmark the permalink.